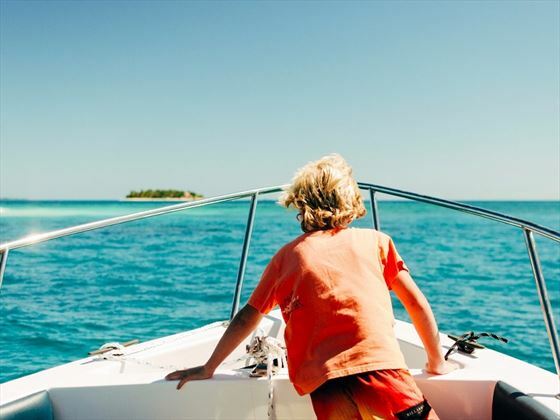 First Landing Resort in Fiji is a beautiful beachside retreat with friendly staff, incredible views, and the desirable island lifestyle. 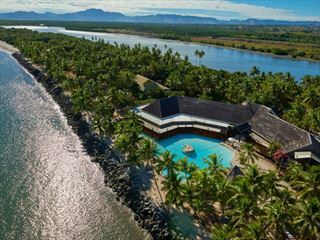 Nestled on Nalamu Beach at Vuda Point, only a 30 minute drive to Nadi town, this secluded resort is a great place to stop over before heading off to the more remote Fijian Islands. 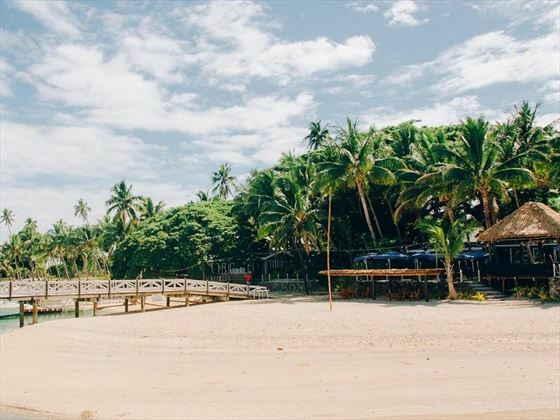 Beginning as a restaurant before turning into a resort, First Landing Resort’s main eatery, Mai Kana, offers local and international cuisine with only the freshest of produce, as well as fun nightly entertainment, including fire walking and Friday night BBQs. Fancy learning how to cook with Chef Daz? The hotel offers the fabulous excursion of buying local ingredients at the market and taking part in a fun cooking class, before tucking into your homemade dishes at the Chef’s Table. At the end of the day, First Landing Resort has one of the best views of the sunset, offering a romantic end to the day. 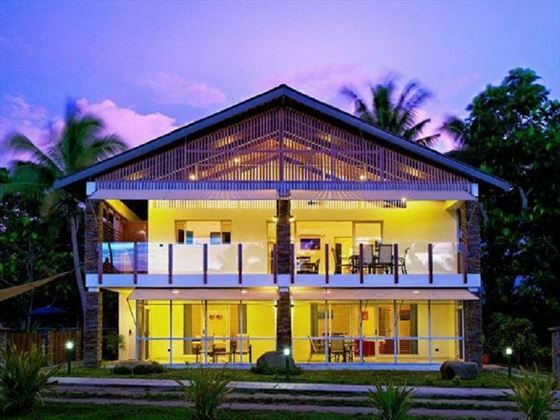 This gorgeous resort is nestled on Nalamu Beach at Vuda Point, overlooking Nadi Bay towards the Mamanuca Islands. 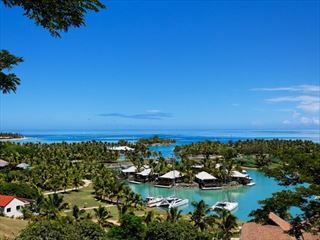 The bustling Nadi town is only a half an hour drive from the resort. 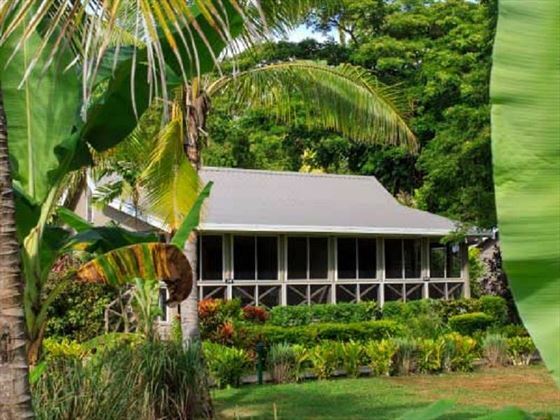 Garden Bure – Lovely affordable villas with garden views. Sleeps a maximum of four guests. Beachfront Spa Bure – Gorgeous villas with ocean views over the Mamanuca Islands, like a private front row seat to Fiji’s famous sunsets, plus the standard amenities and a spa bath. Sleeps a maximum of four guests. 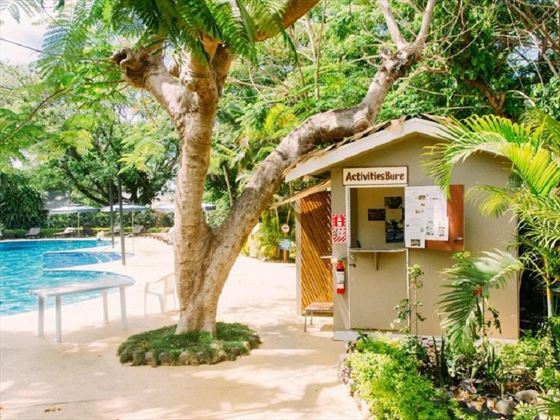 Oceanview Studio Apartment – Featuring beautiful views of the ocean, plus a full sized bathroom, TV, and a semi-private pool. Sleeps a maximum of four guests. Oceanview One Bedroom Apartment – Fantastic one bedroom apartments, a gallery kitchen, a separate lounge room and a spacious bathroom. Great for small families. Sleeps a maximum of four guests. 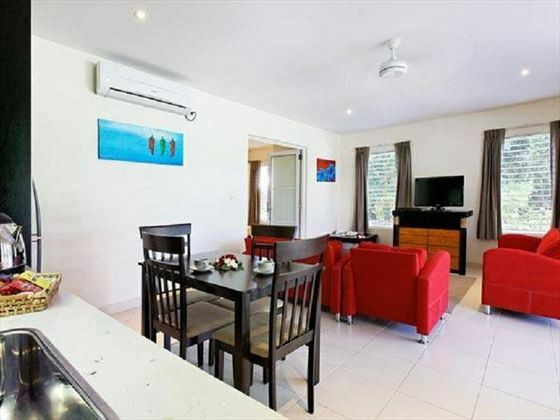 Oceanview Three Bedroom Apartment – Brilliant apartments with three separate bedrooms, a spacious lounge, a full sized kitchen, and a west facing veranda with great ocean views. Sleeps a maximum of six guests. 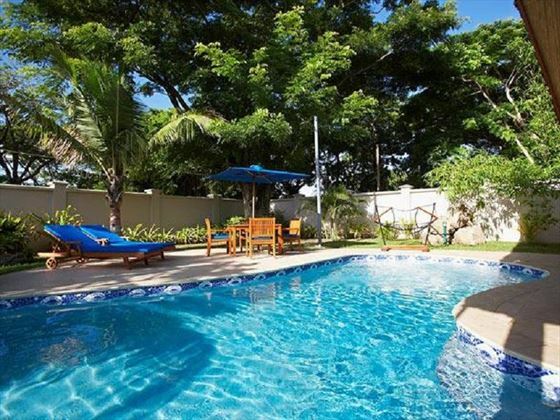 Garden Villa – Pretty villas with two bedrooms with ensuite bathrooms, plus a fully sized kitchen and a private pool in an enclosed tropical garden. Sleeps a maximum of six guests. 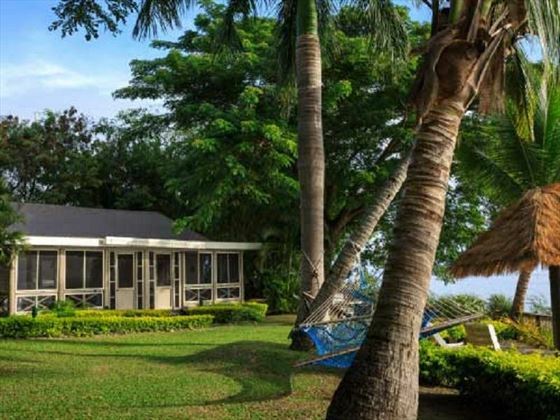 Beach Villa – Enjoy complete privacy with the beach right by your front door. Prince Charles has even stayed in this villa. Sleeps a maximum of six guests. Mai Kana – A lovely beachfront restaurant, where Executive Chef Darren Braddock (Chef Daz) uses his wealth of experience to bring guests delicious local and international dishes. You’ll find a large mix of cuisines here, including seafood, steaks, pastas and wood fired pizzas, all with unique presentations. Some evenings provide guests with entertainment, including fire dancing and Friday night BBQs. Caters for children. Big Foot Char Grill – Head here to watch a live cooking show, and see the chefs prepare your dinner for you. Choose from a wide range of seafood and meats. Nalamu & Domoni Sunset Bars – Two cool bars with beautiful settings, offering tasty cocktails, Australian and New Zealand wines, and ice cold beers. Coffee Spot – Located at the Nalamu Bar, this cute spot offers morning and afternoon teas, as well as coffees, smoothies, milkshakes, and fresh snacks. Mai Kana opening times: 7-10am breakfast, 10-5pm lunch, 6-10pm dinner. 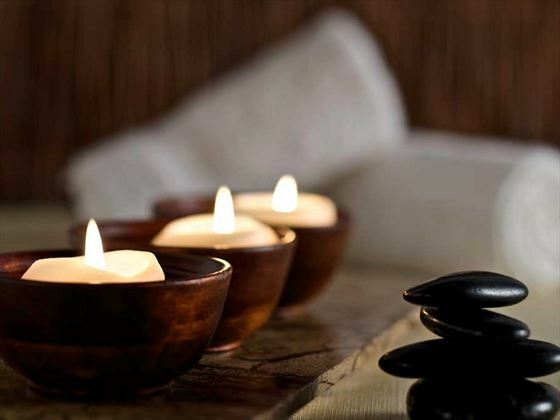 Dream On Day Spa – Offering blissful indulgence, as well as calming rituals and therapies for the face, body and feet. The treatments use Pure Fiji products with a unique blend of Fijian plant extracts. 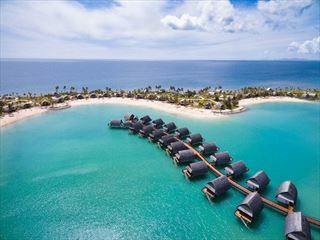 Discover the luxury island experience at this beautiful beachfront resort, nestled on the secluded Malolo Lailai in the Mamanuca Islands. 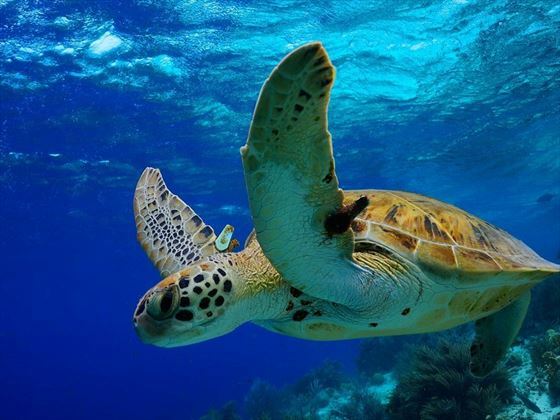 With complimentary watersports, a rejuvenating spa and sumptuous restaurants, you'll never want to leave this intimate island.